Have you already planned your Full Moon Party holiday? If you still need more tips, you will find all the needed information from our site. When everything else is planned and it’s almost time to leave to the Full Moon Party, you must pick the right outfit. You will want to look good but still, have fun without any problems with your clothes. Thailand is a warm and tropic country so remember to dress lightly. You can survive with only a top or t-shirt even at night time. Remember to dress colorfully and pick out a shirt that can get dirty. There is no way of avoiding getting paint on your clothes. Girls can use bikini top instead of a bra in case you want to swim after the party starts. Remember to respect the local Thai culture when not on the beach and cover yourself properly when walking around the rest of the island. 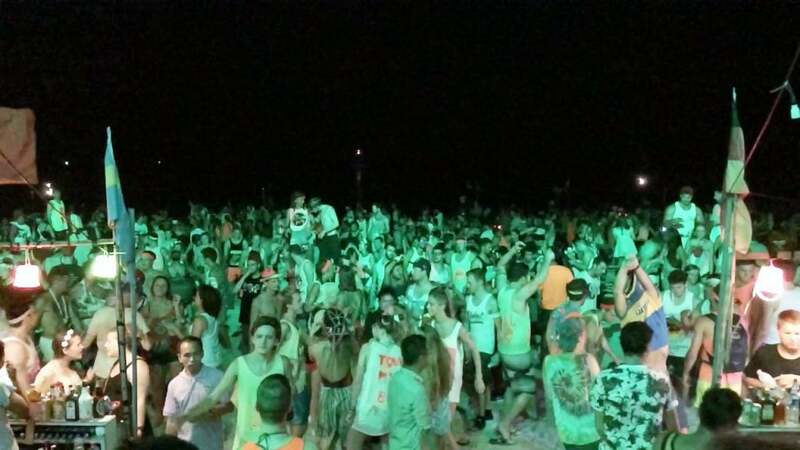 Many travelers wear shorts at the Full Moon Party because you want to dress lightly but at the same time conveniently. For girls dresses or skirts are also a good choice. Put a bikini bottom under your outfit’s bottom part if you want to take a swim before, after or during the Full Moon Party. Remember to respect the local Thai culture when not on the beach and cover yourself properly when walking around the rest of the island. You are going to the beach. There is a lot of sand everywhere and this will limit the shoes we can recommend. Sandals or flip-flops are maybe the best options for both men and women, but remember the risks of stepping on glass or other hazards. Don’t use the most expensive shoes because there is huge possibility that you are going to lose them or forget them somewhere on the beach. You can either take cool accessories with you to Koh Phangan or buy them from the Full Moon Party. Everything colorful, neon color, and things that glow in dark will make your style perfect. Many travelers buy hats, fun sunglasses, and glowing bracelets. Make sure you are ready to lose, break and dirty everything you have with you. This is an easy item to buy once you get to the island, and it’s a great way to support local businesses. You can find ideas here and here. Our website is here to help you with every problem and questions you might have with your Full Moon Party trip planning. Book your accommodation and remember to check the Full Moon Party dates. If you are planning on staying for longer in Koh Phangan, you can also read more travel tips and recommendations for this lovely island.